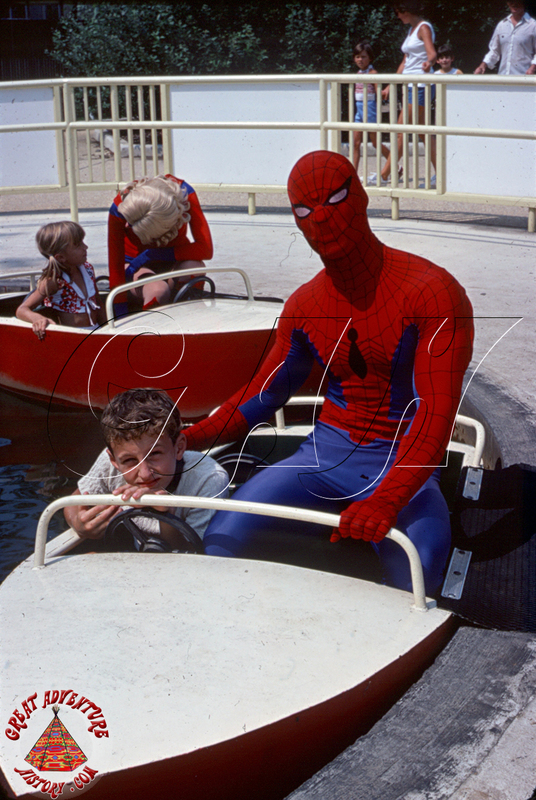 Long before Universal introduced Marvel Superhero Island in their Islands of Adventure theme park and before Disney purchased Marvel Comics, some of the most popular Marvel characters found homes in amusement parks and theme parks around the country including Great Adventure. 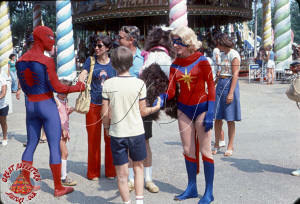 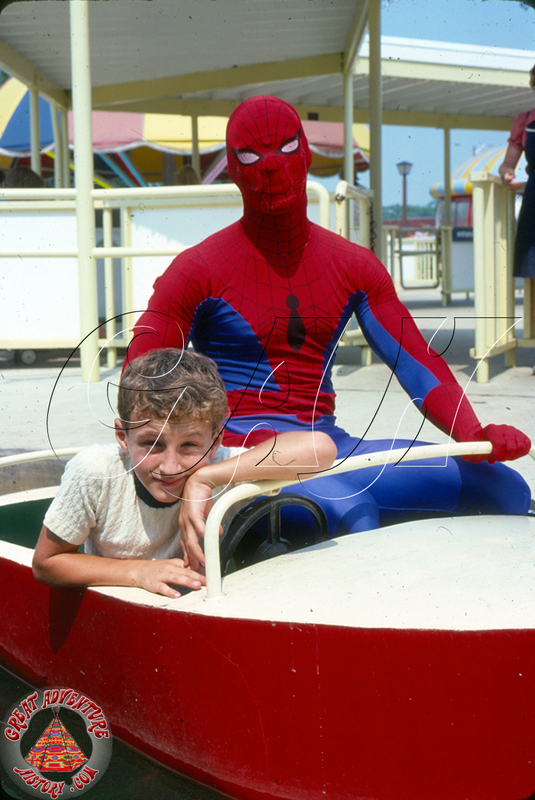 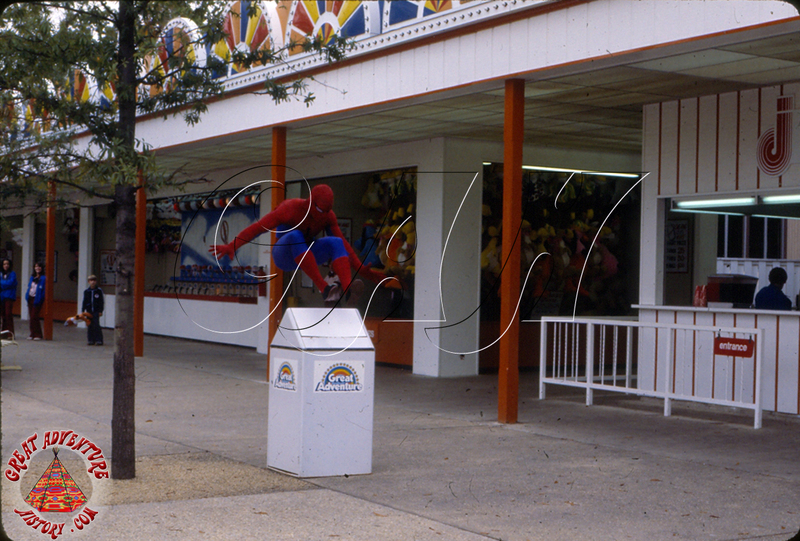 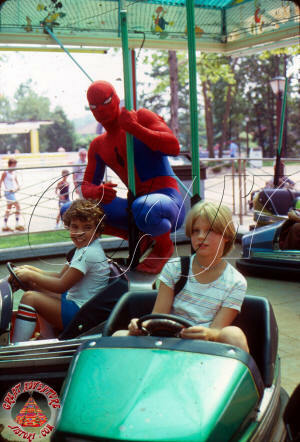 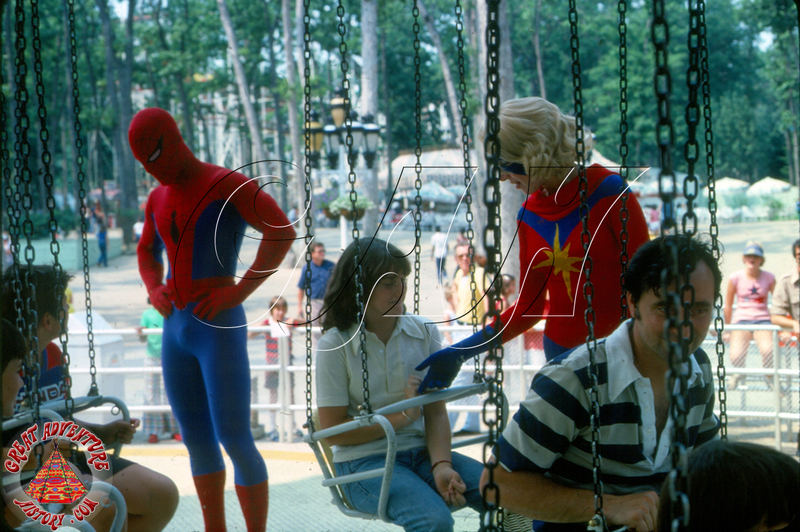 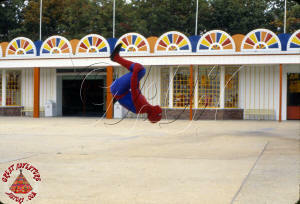 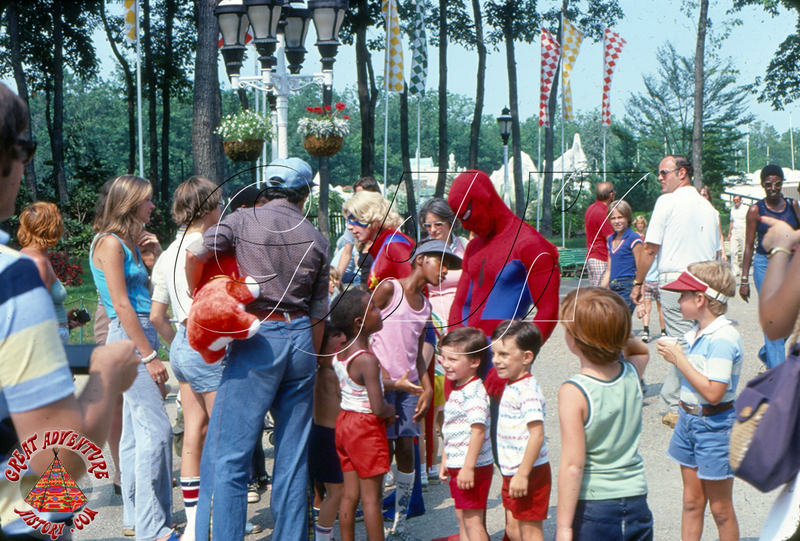 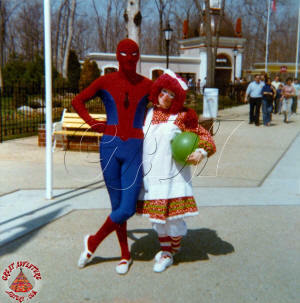 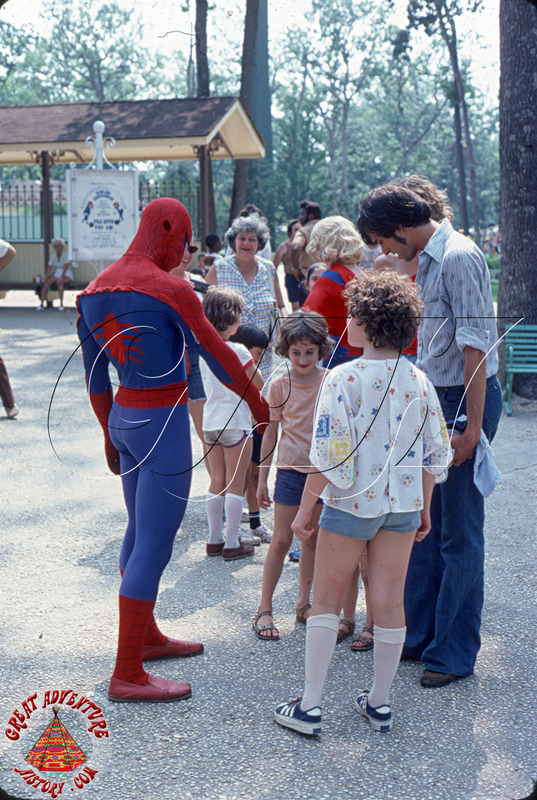 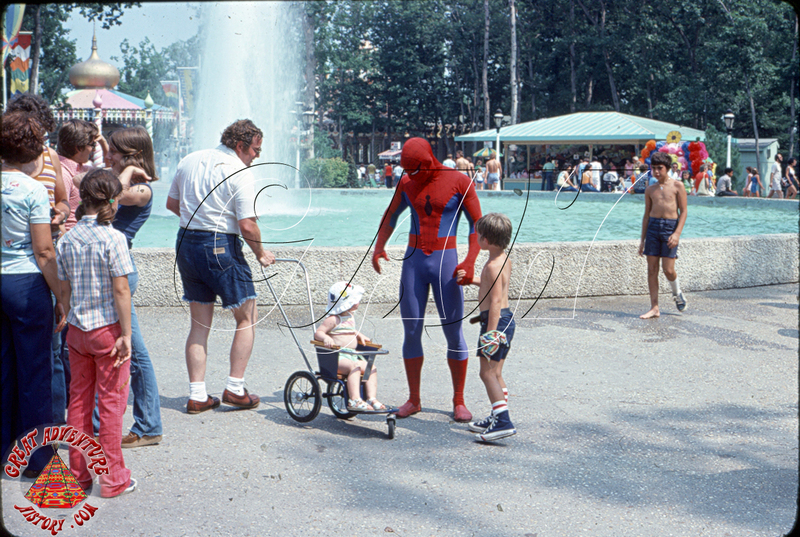 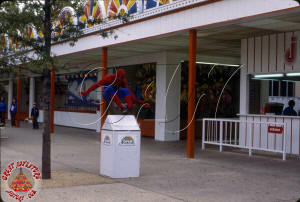 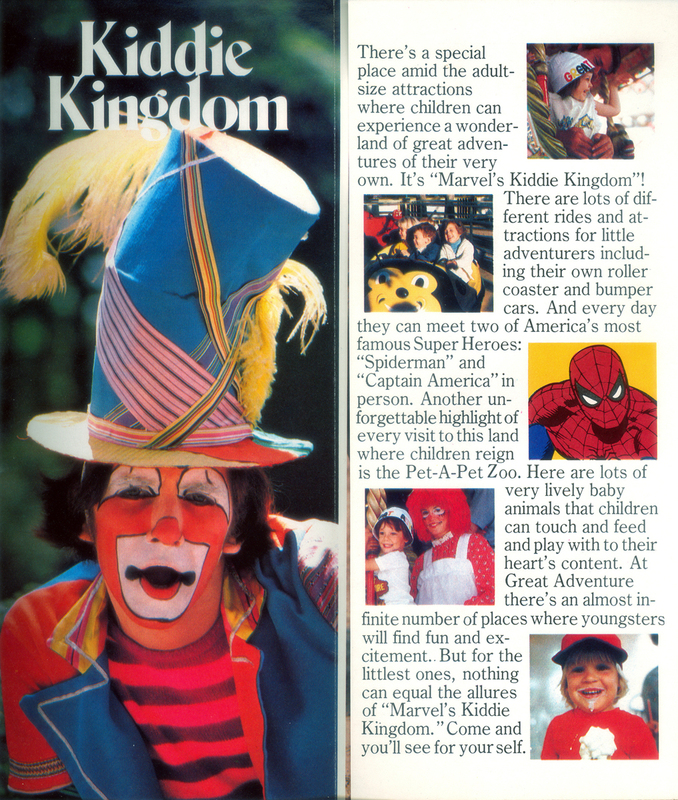 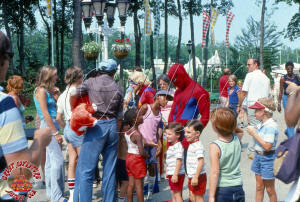 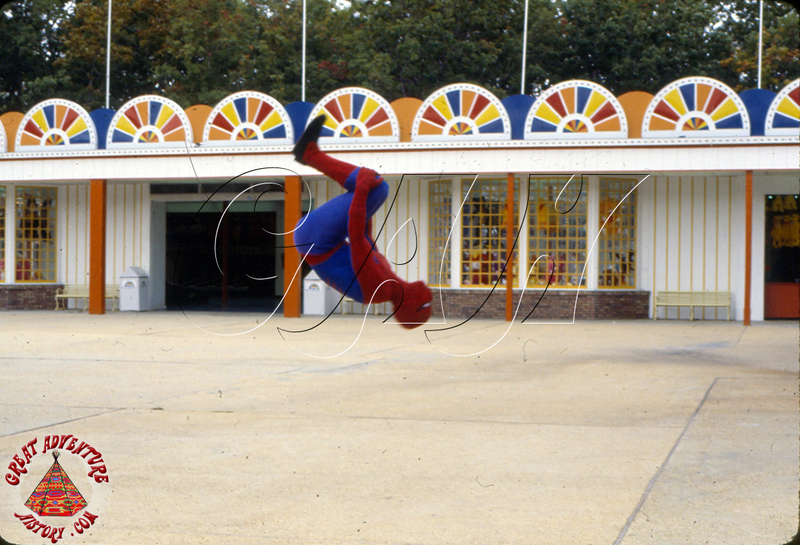 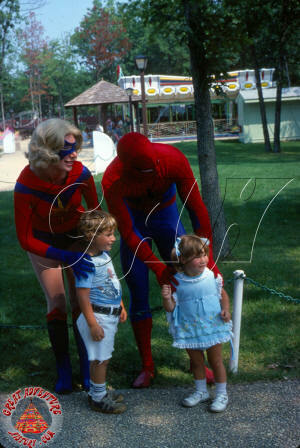 For the 1977 season, the one year old Kiddie Kingdom section of Great Adventure became "Marvel's Kiddie Kingdom". 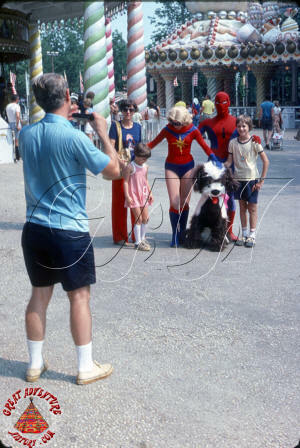 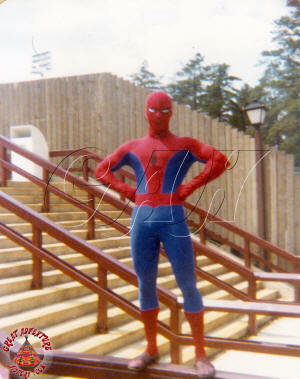 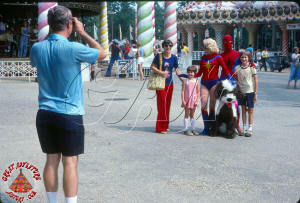 Though no new attractions were introduced as part of this change and it seems to have been in name only, new costumed characters were introduced, bringing the first super hero costumed characters to Great Adventure, long before the arrival of the DC Comics Justice Characters in the 1990's. 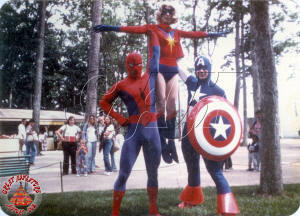 Three new characters arrived with the introduction of Spider-Man, Captain America and Ms. Marvel. 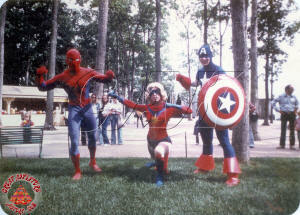 The three crime fighters wore traditional skin tight costumes and roamed the park for pictures with guests. 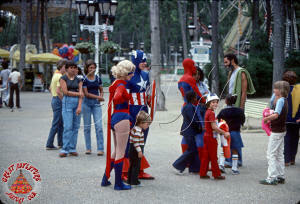 The Marvel superheroes at Great Adventure lasted for just one season. 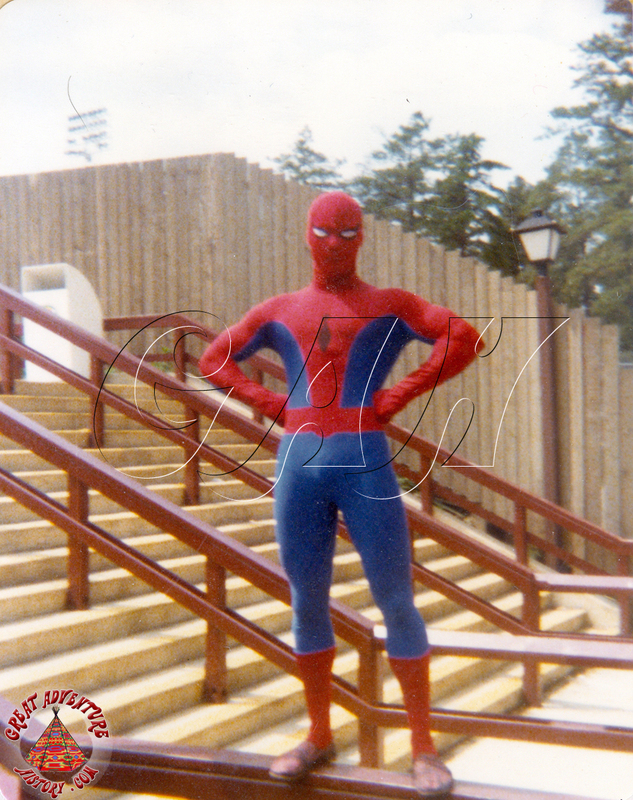 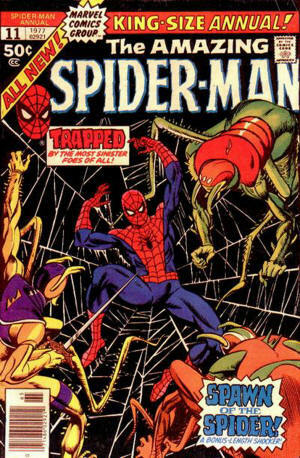 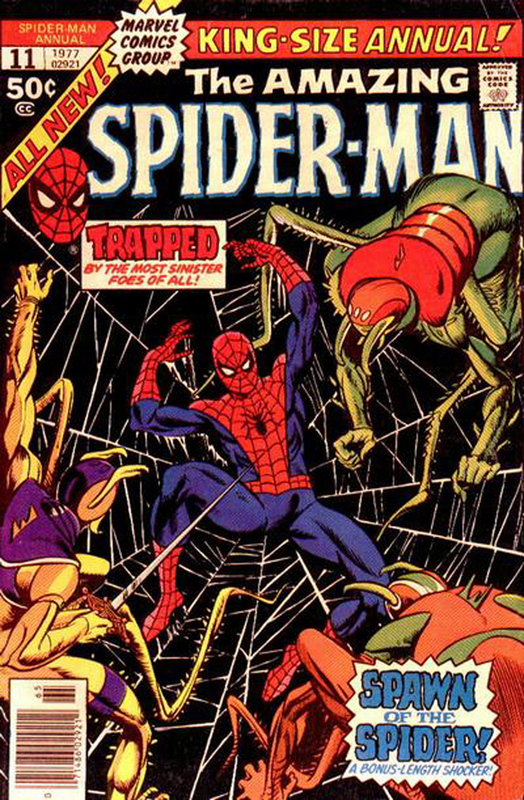 Spider-Man was created by legendary comic artist Stan Lee in 1962, and in the mid 1970's was featured in sketches on the popular PBS series The Electric Company after a run as a cartoon series in the late 1960's and early 1970's. 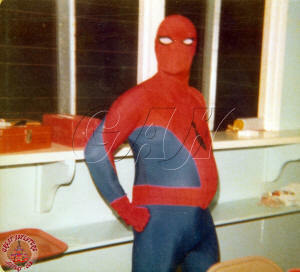 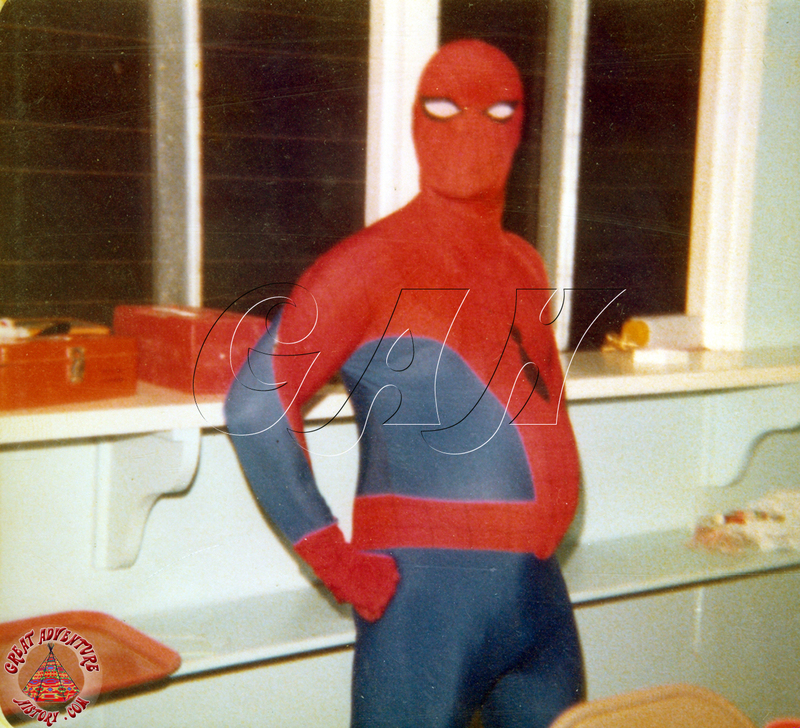 Wearing a skin tight bodysuit and mask, Spider-Man was very athletic looking, and as evidenced by some of these pictures, he was able to show off his athletic abilities while running around the park. 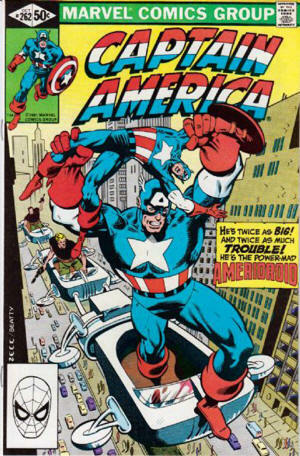 As one of Marvel's oldest super heroes, Captain America dates back to 1941 and was a wartime creation, fighting the axis powers. 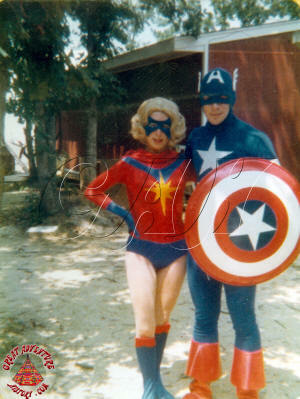 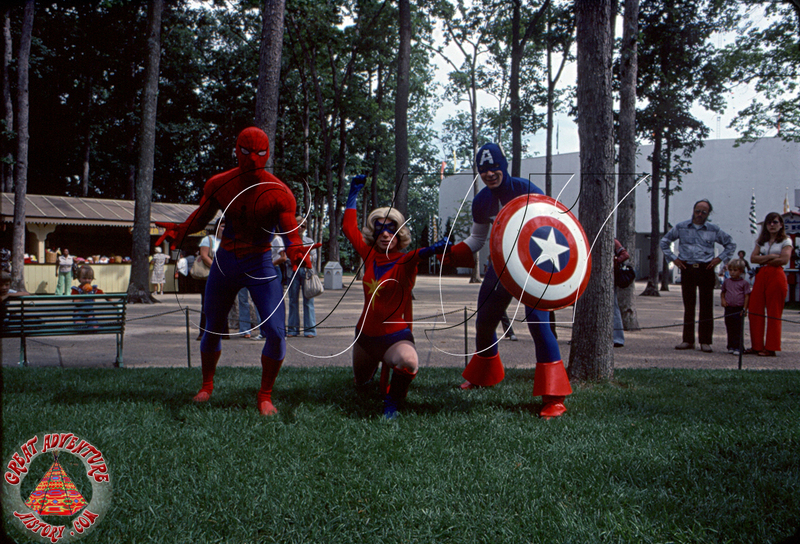 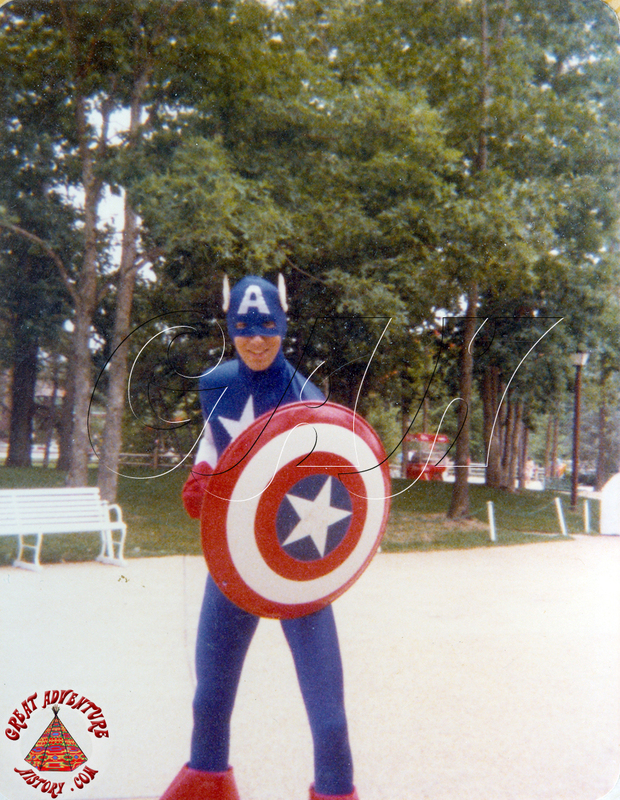 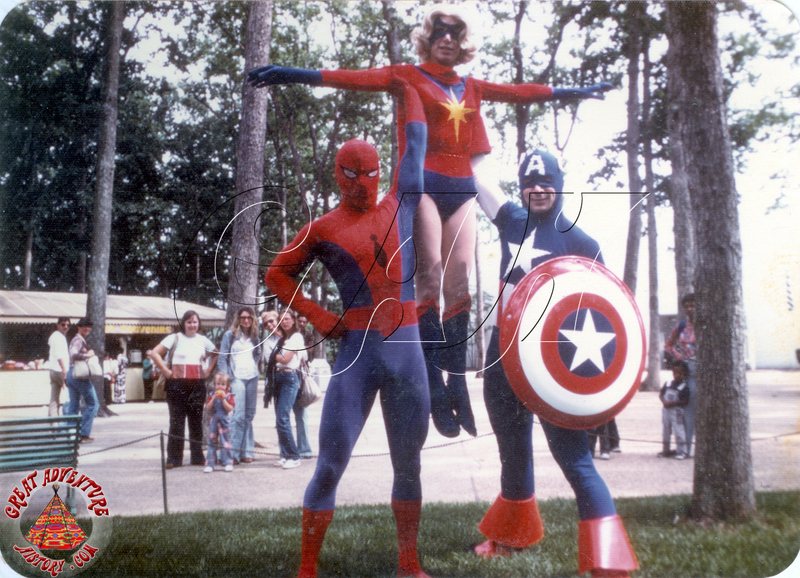 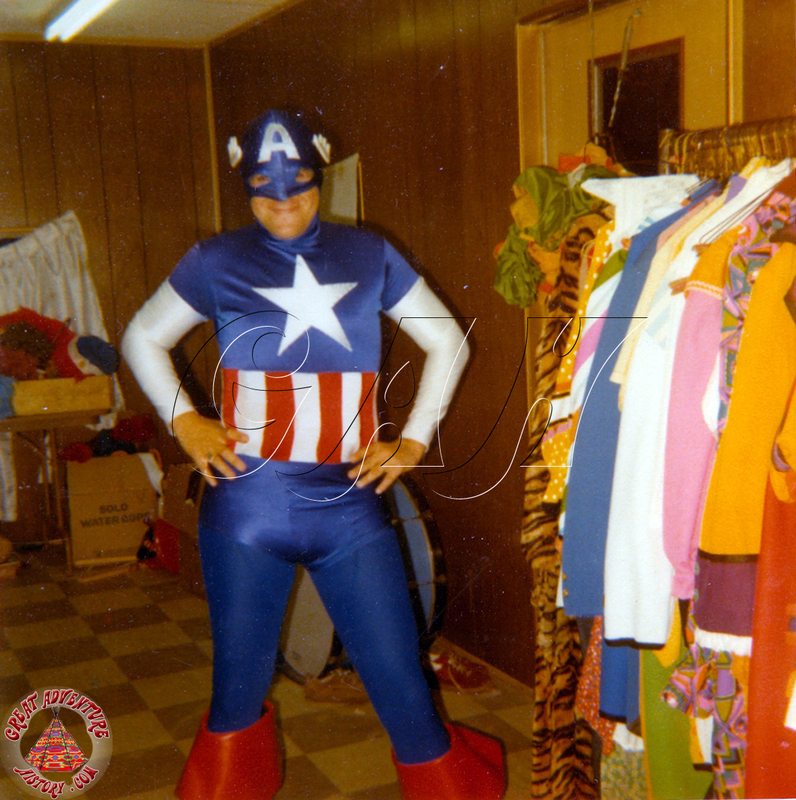 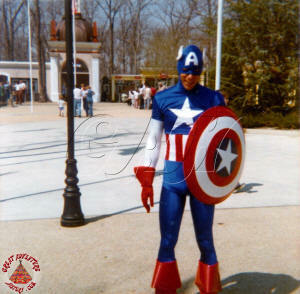 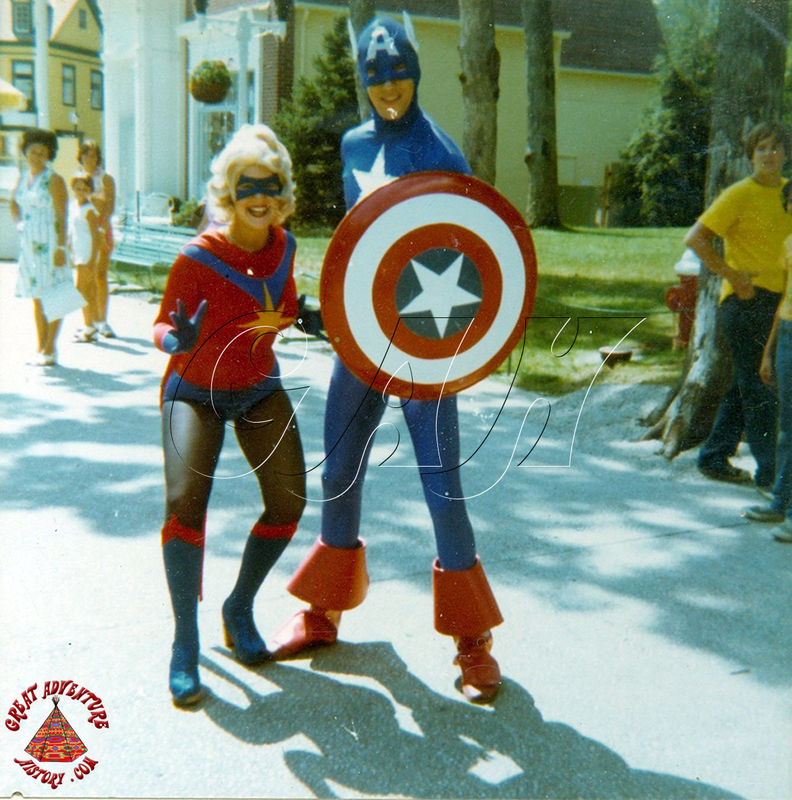 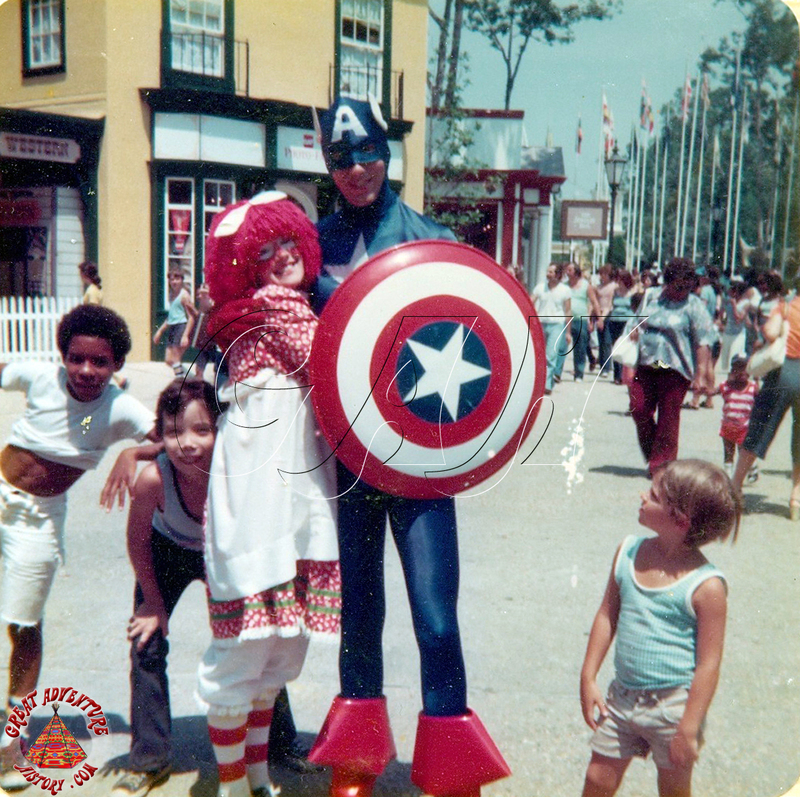 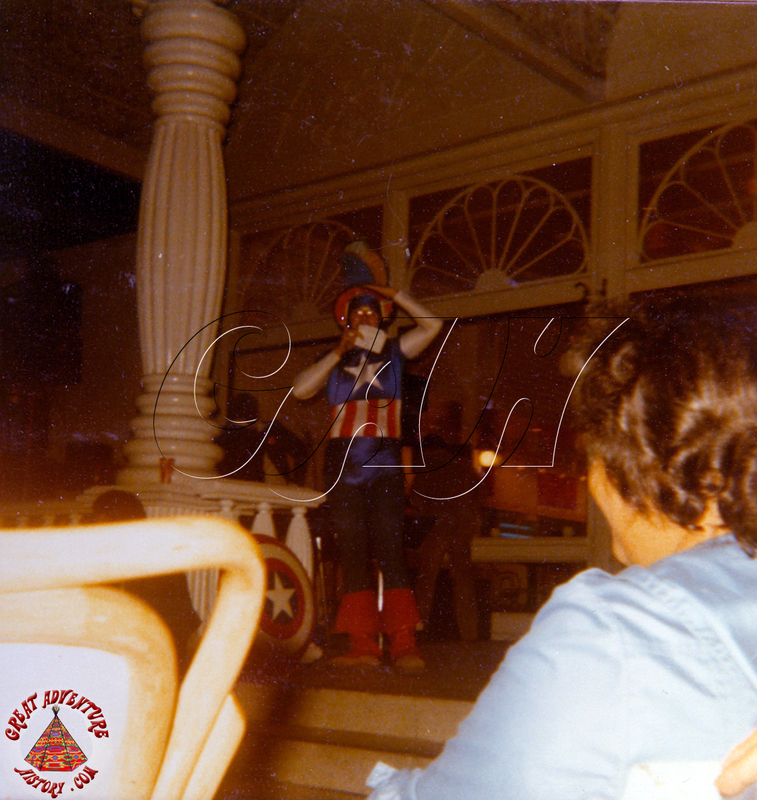 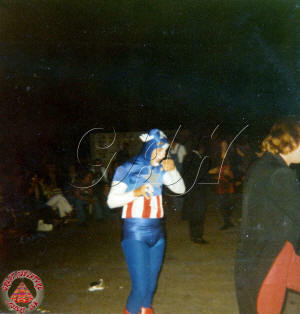 Captain America was another of the Marvel characters introduced at Great Adventure in 1977. 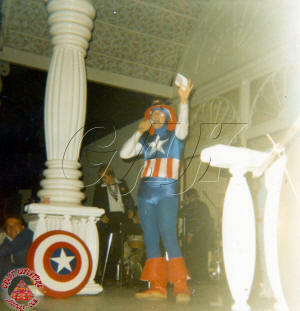 Like Spider-Man, he wore the requisite skin tight costume requiring a performer in top physical condition, but unlike Spider-Man, Captain America's face was visible, requiring an actor with superhero looks. 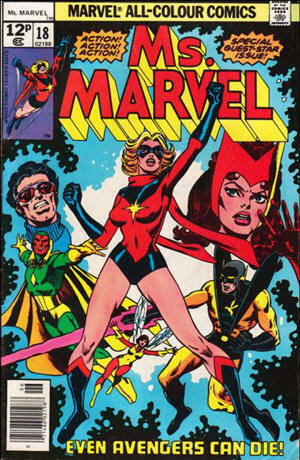 Ms. Marvel was originally introduced in 1968, but was relaunched in January of 1977 most likely in response to the popularity of the Wonder Woman television series as well as in response to the women's-lib movement of the time, trying to appeal to a new generation of girls interested in comic books. 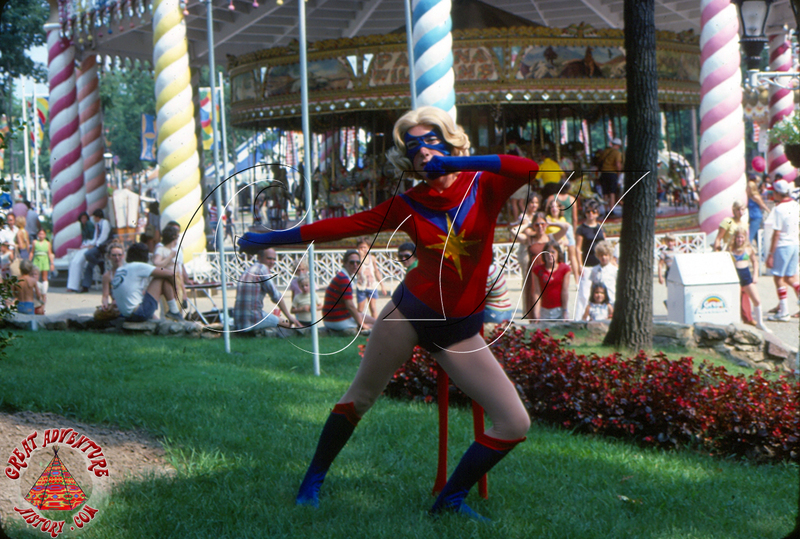 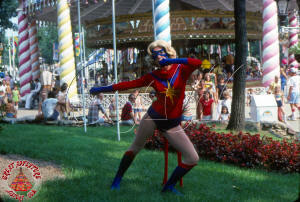 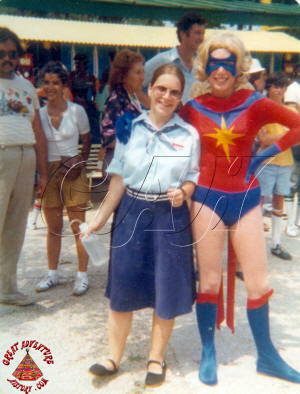 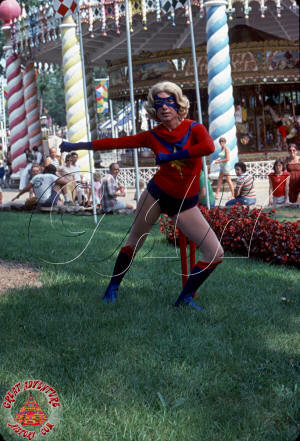 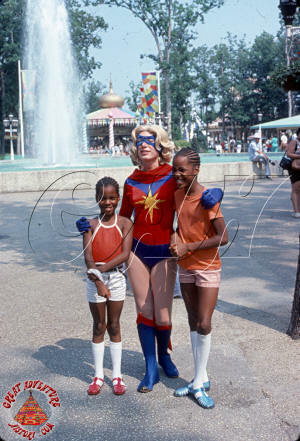 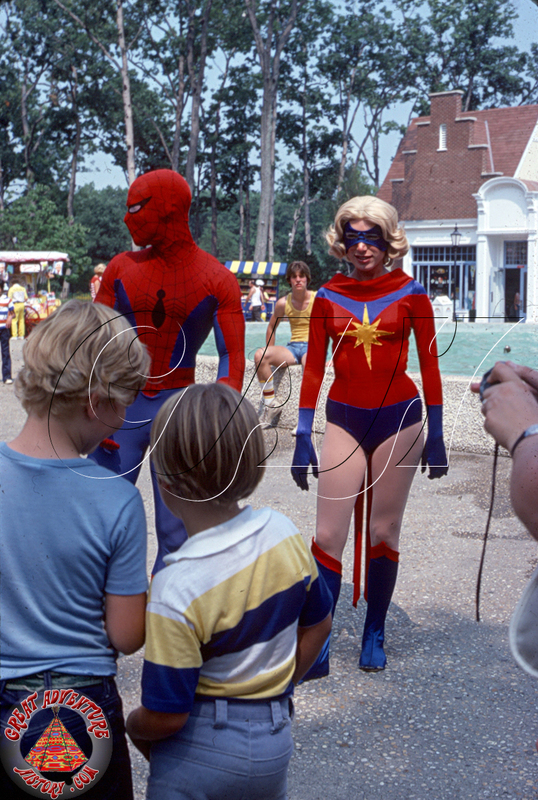 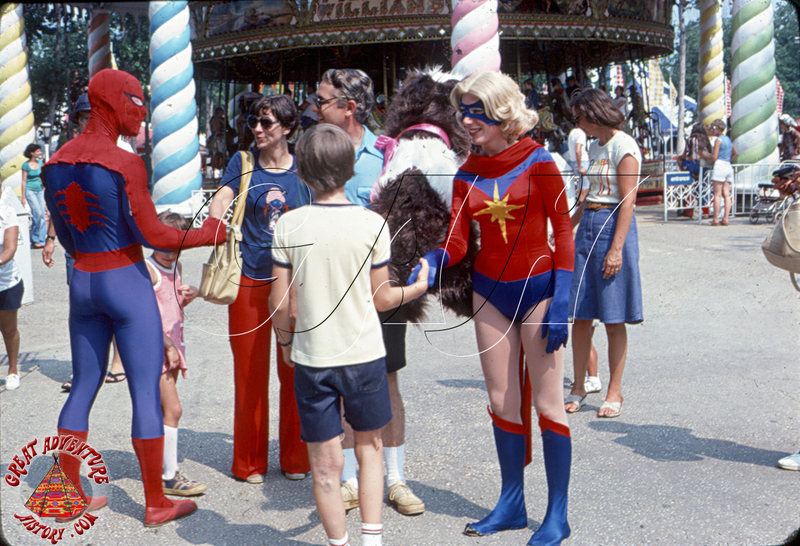 Ms. Marvel may have been the least known of the three Marvel characters introduced at Great Adventure, but with her tight costume may have been the most popular among some of the park's guests. 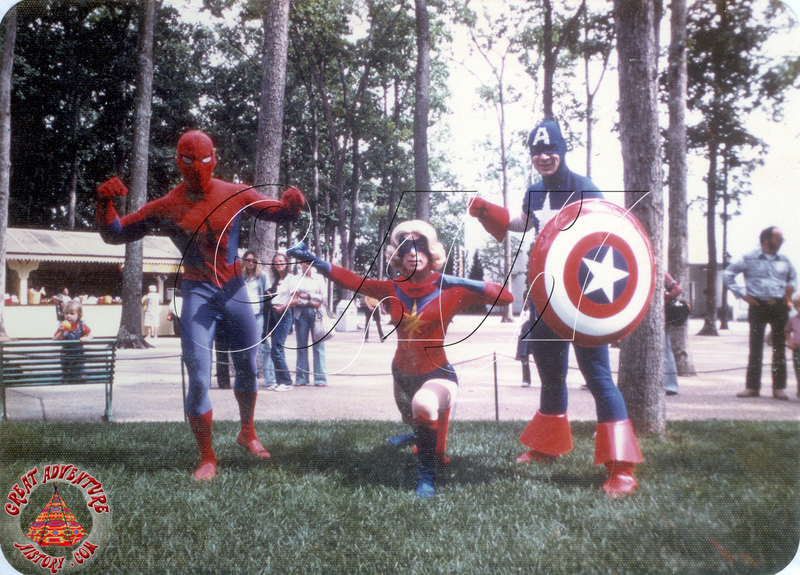 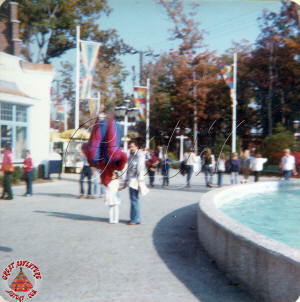 Together and separately, they could be seen striking heroic poses for guests throughout the park as well as inside Kiddie Kingdom throughout the 1977 season. In late 1977, Great Adventure was acquired by Six Flags and whatever contract the park had with Marvel Comics came to an end.